We provide our clients with all kind of microgrid´related background information. This starts with data that is needed for the basic understanding of the microgrid market segment. Amongst our best-sellers is the kick-off / market entry workshop. If you are new to microgrids this workshop will save you months of work. 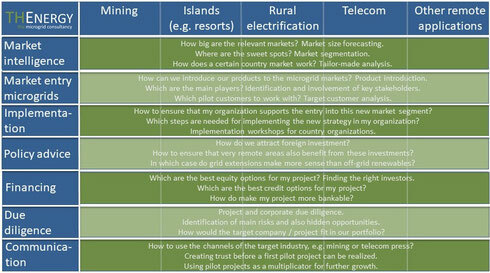 In a very condensed way, we present key learnings from the off-grid markets. Our "market intelligence" services also contain information on specific country markets and market segments. We also provide data that will assist you in setting up your first microgrid projects. Market entry and new product launches are complex disciplines that demand a wealth of knowledge and experience. Often they are crucial to the future success of your company. We can assist you; we have an unmatched network in the microgrid, minigrid, and offgrid community! We can set up meetings for you with potential customers in off-grid markets such as most of the African, Asian, Latin American countries, and Australia. We help you to find the right partners to commercialize your product successfully. We can also assist you in finding pilot projects. Finally, communication is an important aspect of a market entry (see below). We hold the reins in our hands to make your market entry a success story. As market entries are our main functional specialization, we offer our services also for renewable energy, energy storage and e-mobility solutions that are not necessarily linked to microgrids, minigrids or offgrid power generation. If you are an overseas customer and want to enter the European renewable energy, storage or e-mobility markets have a look at the "Market entry - European Markets" section. For many companies, minigrids and microgrids are a completely new business field. The question of how to implement it in the organization is key. Often it makes sense to use existing resources such as the local sales department in a target country. We facilitate the implementation process with workshops. Knowledge transfer and motivation for the new solutions are typically the focus of these workshops. From a regulation point of view, microgrids are complex. Many different players such as governments, rural electrification agencies, network agencies, and development agencies are involved. 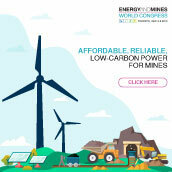 Leading stakeholders around the world place their trust in THEnergy. We assist them in defining tailor-made regulations for specific countries. 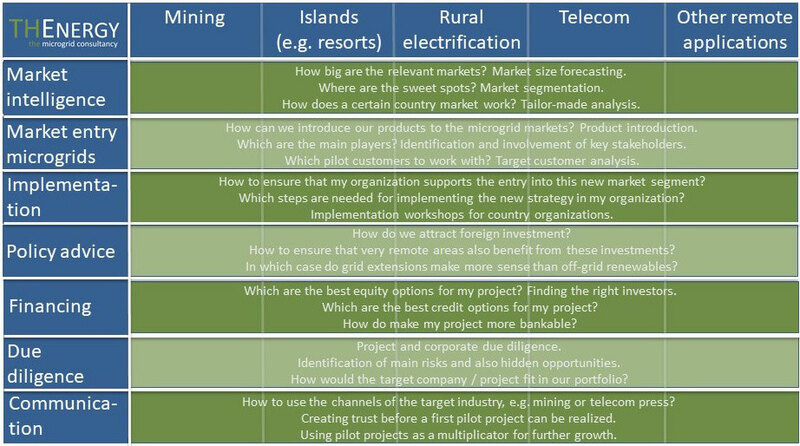 Financing is another key issue in the offgrid, minigrid and microgrid sector. We help project developers to find the investors that fit best to their needs. This can be on a corporate level or on a project level. We cover both equity and debt financing. Depending on the specific project, family offices, big investments funds, crowdfunding and crowdinvesting platforms, commercial banks, or development banks suit best. The microgrid sector sees quite some M&A activities lately. We were involved in several major due diligence processes in rural electrification on behalf of corporate investors. Investors also place their trust in THEnergy regarding project due diligence. We regularly contribute to various publications. 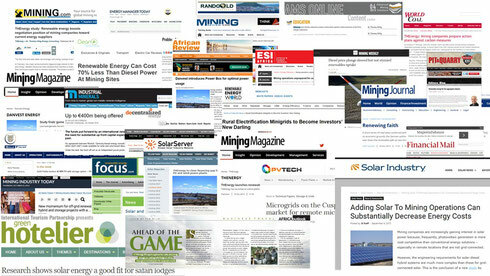 E.g., have a look at our Renewable Energy World articles. As we regularly provide journalists with cutting-edge content, we managed to build up an excellent media network over the last years. Communication is often an important part of success in the market entry process. If we see that your solutions have the potential to advance the off-grid market development we can offer to undertake a screening of your product in the form of a white paper, a study, or a report. We also offer to use it for communications. We only accept this kind of evaluation if we really see that your solutions have the potential of adding value to the microgrid or off-grid markets. We started with a consulting focus on renewables for commercial and industrial off-takers - such as the mining industry. Lately, we receive more and more mandates in rural electrification / energy access. We conducted several market research projects, were lead consultants in two due diligences, and held several workshops about rural electrification applications.